Last week, NPR had a week-long series considering a recent Pew Forum survey of the religious character of the younger generations. While there is much hand-wrangling over the issue amongst our churches, this series probed deeply into the questions raised and tried to assess the reasons and thoughts of these “Nones.” I urge you to listen as you have opportunity. 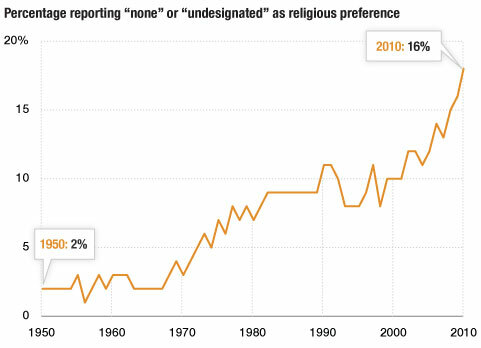 1: Losing Our Religion: The Growth Of The ‘Nones’ : The Two-Way : NPR. 3: After Tragedy, Nonbelievers Find Other Ways To Cope : NPR. 5: Making Marriage Work When Only One Spouse Believes In God : NPR. 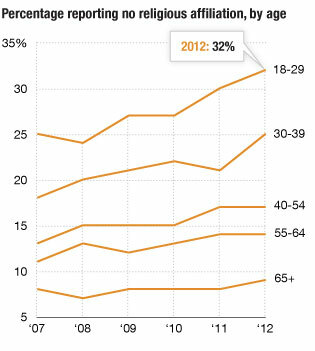 6: As Social Issues Drive Young From Church, Leaders Try To Keep Them : The Two-Way : NPR.